When you have a wound, it will need care and observation. After stitches or staples are placed to close a wound, the area may be covered with a thin layer of antibiotic ointment and covered with a nonstick bandage. Your doctor will give you specific instructions on how to take care of your stitches or staples. Please make sure you follow these instructions. You need to check with your doctor to make sure how long you need to keep your wound dry. In certain cases, the bandage can be removed after 24 to 48 hours and can be gently washed to remove the crust. Make sure not to scrub or soak the wound during the first 48 hours. 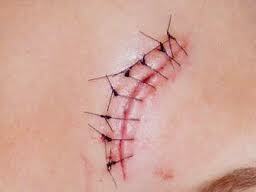 It is normal for stitches or staples to cause a bit of redness and swelling around the skin. Your wound might feel itchy or irritated. Please make sure to check for signs of infection. Depending on the type of cut, it might not need a bandage if the area does not get dirty, the cut does not require draining, and if there is no contact with clothing rubbing on the skin. Your doctor will determine when your stitches or staples are to be removed. The determining factors to the length of having stitches or staples lies on several factors such as location, depth, and size of your wound and general health. Please make sure that you follow his or her instructions. This entry was posted in Cuts, stitches, Wounds and tagged abrasion, doctor, emergency, National Cancer Institute, staples, stitches, Wound, wounds. Bookmark the permalink.